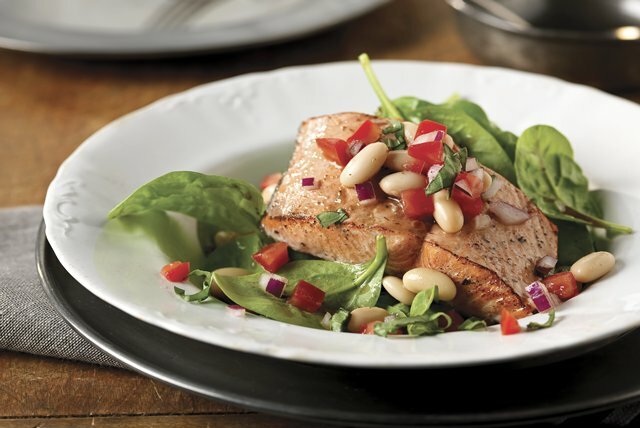 Give salmon a boost with balsamic vinegar, a salad of fresh tomatoes, basil & cannellini beans. This dish with canellini beans & herbs is really flavorful. Drizzle 2 Tbsp. dressing over fish in shallow dish. Refrigerate 30 min. Meanwhile, combine beans, tomatoes, onions, basil and 2 Tbsp. of the remaining dressing. Heat grill to medium heat; cover grate with foil. Place fish, skin-sides down, on foil. Grill 10 to 15 min. or until fish flakes easily with fork. Toss spinach with remaining dressing; place on 4 serving plates. Top with fish and bean mixture. Substitute 1 can (15 oz.) chickpeas (garbanzo beans) or white kidney beans for the cannellini beans.